Soybean seed and seedling diseases are common in the north central region, resulting in poor crop establishment and increased production costs. According to the American Soybean Association, soybean seed and seed treatments currently constitute 48% of soybean input costs. The primary causal agents of seed and seedling diseases in the region are the fungi Fusarium and Rhizoctonia, and the fungal-like organisms Pythium and Phytophthora, which are classified as oomycetes, also known as “water molds”. There has been a notable increase in disease caused by oomycetes in U.S. soybean production over the past 20 years. Possible explanations for this increase are the lack of genetic material resistant to Pythium, increasing number of pathotypes of Phytophthora sojae able to overcome current Rps resistance genes, changes in precipitation and temperature patterns, and cultural practices such as earlier planting. 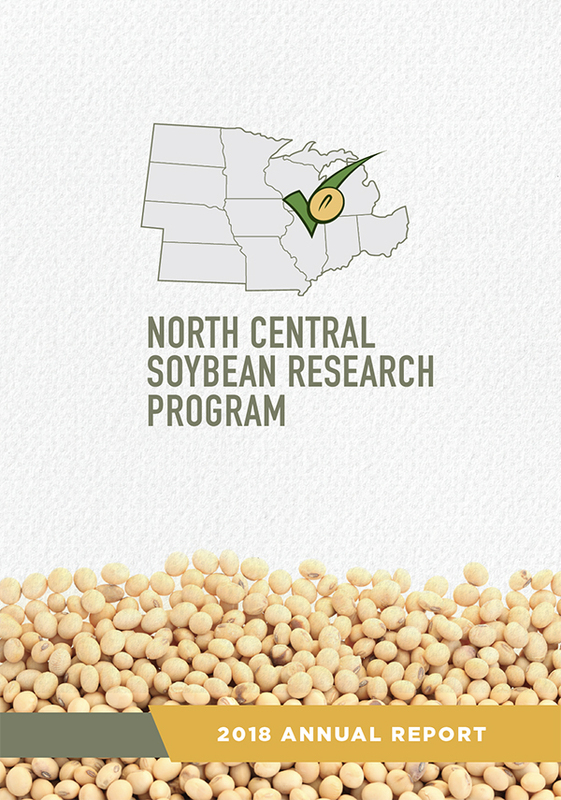 With checkoff and other funding provided by the North Central Soybean Research Program, the USDA, United Soybean Board, and the Grain Farmers of Ontario, 19 plant pathologists undertook a survey to look more closely at oomycete species associated with diseased soybean seedlings across 11 major U.S. soybean-producing states and Ontario, Canada. 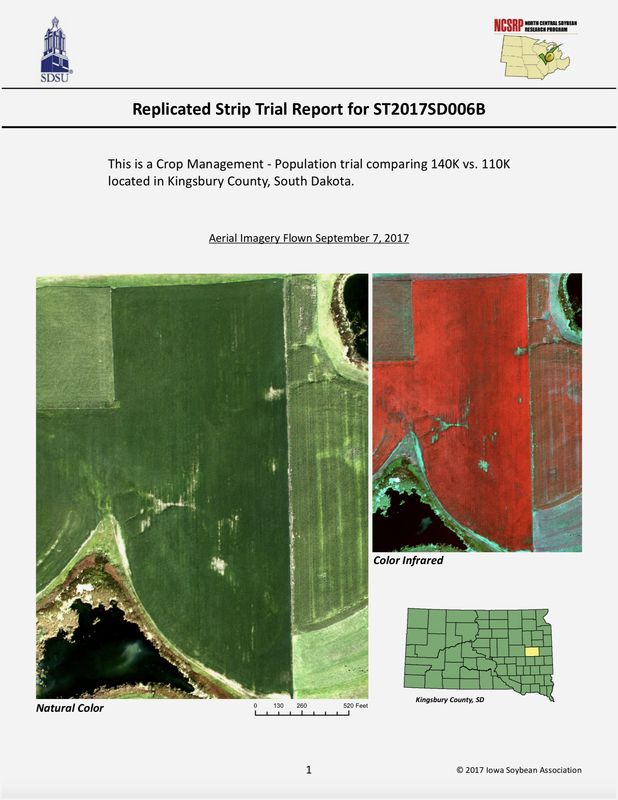 The study fields were selected based on a field history of seedling disease and plant stand issues. All collaborators used a standard protocol in which 50 symptomatic soybean seedlings were collected along a W-shaped transect in each field, and processed the samples within a day of collection. From over 3000 isolates collected over two years, a total of 84 oomycete species were identified. Pythium was the primary oomycete species identified, followed by Phytophthora, Phytopythium, and Aphanomyces species. Of the 84 oomycete species, 43 species were determined to be highly pathogenic on soybean seedlings. The remaining 41 did not have a significant effect on seedling growth compared to non-inoculated controls. Some of these pathogenic species had been previously reported as root pathogens, others were new. Most of the pathogenic oomycetes also caused seed rot at temperatures that are representative of planting conditions in northern and southern parts of the region. Thirteen oomycete species caused seed rot at 55°F (13°C), 11 species caused seed rot at 68°F (20°C), and 7 species were able to cause seed rot at both temperatures. Interestingly, two Pythium species caused seed rot but did not cause disease on seedlings. DNA sequencing allowed us to look more closely at the genetic composition of oomycete communities. 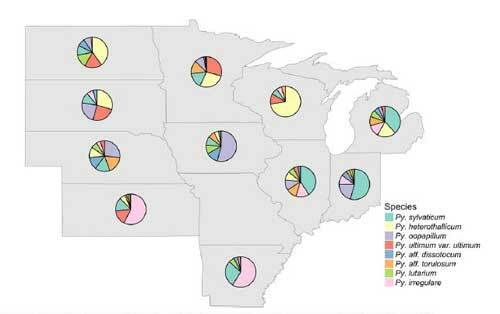 We found that most of the oomycete species were present in each field in every state, showing that at this plant stage, Pythium species and other oomycetes are widely present on symptomatic soybean seedlings. Within a single field, we found that oomycetes were distributed fairly evenly throughout the field, with a moderate to high diversity of species present. The abundance of the top eight most frequent pathogenic oomycete species, which were all Pythium species, was examined by state. It was evident that there were dominant species across multi-state areas. For example, Pythium sylvaticum was dominant in MI, IL and IN whereas states further north were dominated by Pythium heterothallicum. These northern states were also dominated by Pythium ultimum var. ultimum. States towards the south were dominated by Pythium irregulare. NE, IA and SD communities also contained a considerable percentage of Pythium oopapillum isolates. Abundance by state of the top eight most frequent pathogenic oomycete species found in the survey. This information is extremely valuable for testing different oomycete management strategies. For example, the data are being used to select a pool of candidate pathogens to aid breeding programs focused on screening for resistance to oomycete pathogens. Other researchers are using the information to refine testing of fungicide efficacy and monitoring fungicide resistance. The information on community composition will help us develop models and strategies to reduce and manage species related to disease on soybean and possibly other crops. Further work is planned on the influence of cultivar, crop rotation, management inputs, soil fertility, and tillage practices on specific oomycete communities and root diseases.